Occupy Gezi is a movement that started in Istanbul in order to preserve one of the very few green areas left in central Istanbul which then turned into a group of massive, nation-wide anti-government protests. 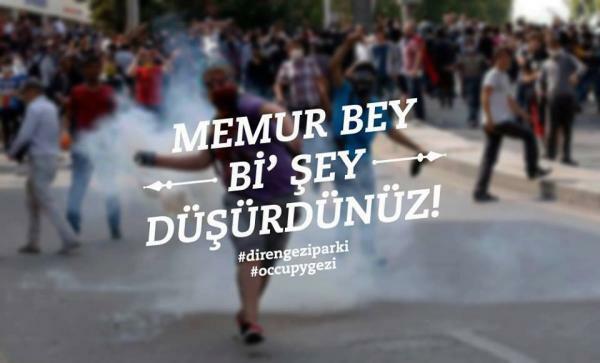 The protests which began by the occupy movement in Istanbul, spread to other cities such as the capital Ankara, and Turkey’s third largest city, Izmir, and they ignited a flurry of creative production that resulted in a variety of posters, banners and street art. The visual material created in the ethos of the protests are striking images that capture the nature of the protests. 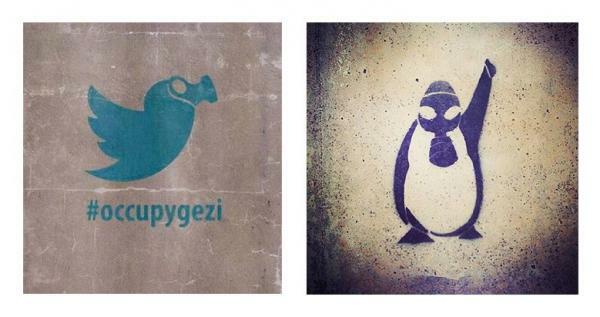 On the other hand, the stencil of a defiant penguin who also wears a gas mask symbolizes the media corruption in Turkey (above right). Penguins are now associated with the self-censorship of the mainstream Turkish media after CNN Turk, a major news channel, broadcasted a documentary on penguins while the civil protests and police violence were at their peak – instread of covering what was happening on the streets. Turkish police have been harshly criticized by the protestors due to the use of unprecedented amount of tear gas as well as the police violence witnessed during the protests. Yet, among the images that are circulated in the social media which support the protestors and criticize the government or the police, humour dominates. The digital poster above reads “Mr. Officer You Dropped Something”, in front of a blurred photo in which an activist is throwing back an active tear gas canister back at the riot police. 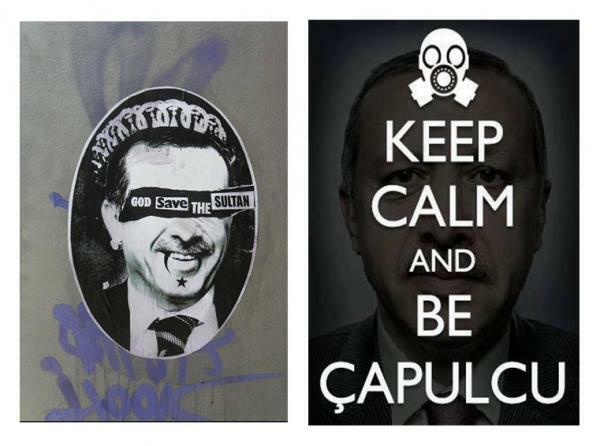 The digital poster above right uses Prime Minister Erdogan’s portait by the photographer Platon in the background and displays the phrase “Keep Calm And Be Capulcu.” Prime Minister had used the word capulcu–which means a looter–to describe the activists after the protests grew in magnitude in May 31, 2013. The word capulcu was quickly adopted by the protestors who started to define themselves as capulcu . This has a humorous irony because the protestors did not see themselves as looters since the dominant majority of them were well educated urban middle class people who abstained from looting and other acts of vandalism. The image of a policeman blowing pepper spray on a girl in red (above left), rapidly became the most recognized symbol of the protests and was transposed to the city walls, streets and roads with stencils. The girl in red in the stencil image (above right) is considerably larger than the police as it symbolizes the growth of the resistance as the police violence got rougher. 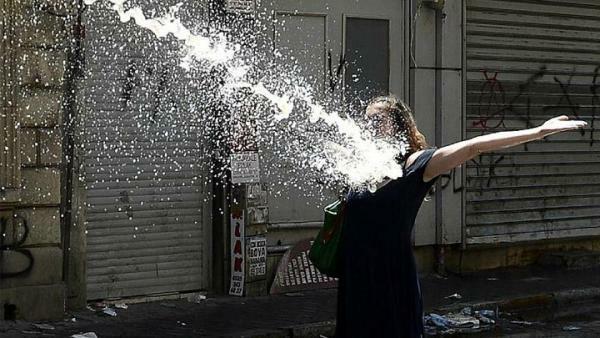 Another image which rose to prominence during the protests was the girl who stood in front of a police water cannon opening her arms, exposing her torso (above). Her image became a symbol of non-violent resistance against police force and is displayed on a variety of printed or digital posters about the protests. Below are two digital posters created to be used in the social media. 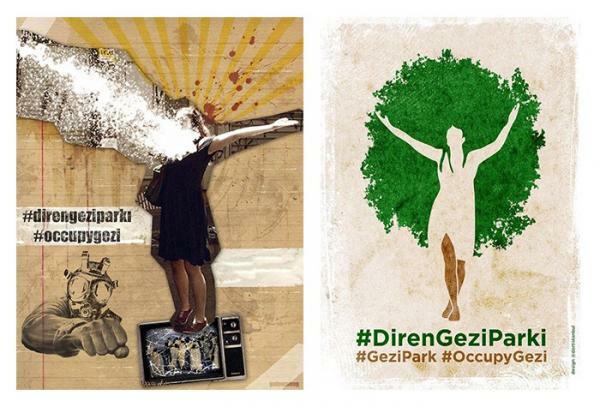 The phrase written as a hashtags in the posters below, “Diren Gezi Parki” means “Gezi Park Resist” which has been one of the favourite hashtags for the Occupy Gezi movement. The colourful and playful yet simple graphic design below, which states the demands of the protestors, reflects the youthful energy of the activists. The design is clean: each demand is symbolized by a single visual; with distinct background colours; and specific words of each demand is emphasized by an increase in font size of certain words which helps to convey the message clearly by avoiding a wall of text. Considering that these images, which are only a handful among many, are a result of the past 15 days (since the protests began), there is going to be a lot more as the protests and the occupy movement continue. 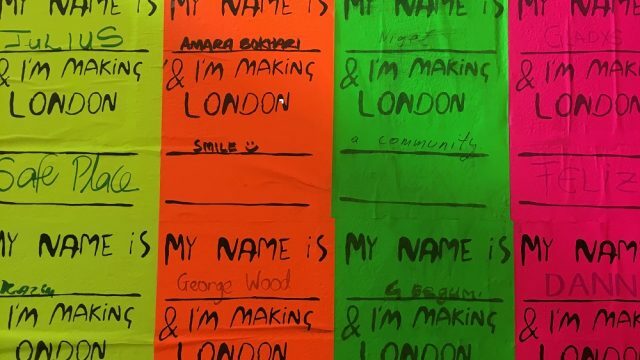 Whatever the outcome of these events, it is certain that the artists, designers and activists have responded rapidly, with a highly creative and humorous body of works to the Occupy Gezi movement which will definitely have a rich visual legacy for the future generations. Yaman Kayabali is a postgraduate student in the Art History and Museum Curating program of the University of Sussex. Prior to his studies at Sussex, he worked as a project coordinator in an exhibition design company in Istanbul. His area of interest is the relationship between art and politics. He is currently researching on the effects of political ideology on the early republican architecture in the new capital of modern Turkey with a comparative perspective of Turkey’s Western European counterparts. Yaman is currently an intern in the Research Department at the V&A. Please note that the images used in this blog post have been freely shared online and on social media. They are not V&A images.